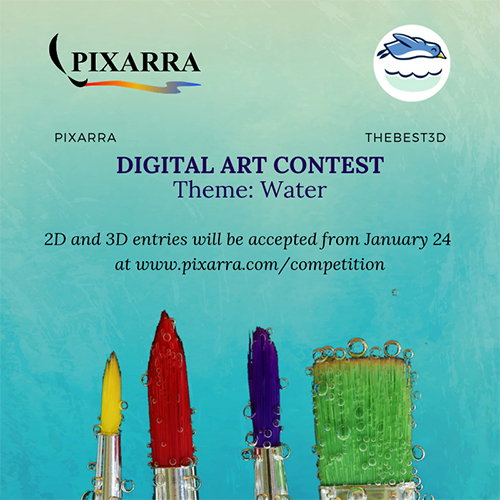 Pixarra and TheBest3D are inviting you to take part in their joint digital painting competition “Water” which will be held in January and February 2019. The contest is international and is open to 2D and 3D artists of any level. Entries will be accepted through a submission form on the competition’s official page: http://www.pixarra.com/competition from January 24 to February 14 and voting will be allowed starting from February 15th. Popular choice - Pixarra Studio Product by choice and PD Artist 11. The winner will be determined by the total number of votes. For more information, visit http://www.pixarra.com/competition, http://www.pixarra.com/rules and https://thebest3d.com/competition/ or contact the Organizer at support@pixarra.com. The names of the winners have been published on the competition page. Thanks for participating and keep watching for our next contest very soon!